The formerly secret location of a nuclear bunker that was to house the USA's Congress if World War Three had broken out. The mere existence of this installation under the grand old resort hotel The Greenbrier and especially its real function were kept secret until 1992. But now it has been declassified and decommissioned and guided tours are offered to visitors/hotel guests. More background info: Thought up during the Eisenhower administration, construction of the bunker began in 1958 and was completed in 1961, i.e. at a crucial time of the Cold War, just before the Cuban missile crisis. 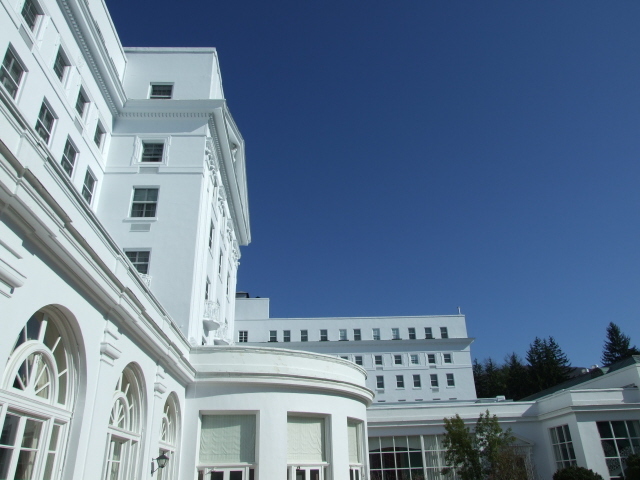 The bunker itself was installed beneath a new wing added to the famous Greenbrier hotel – so the building site as such aroused little suspicion. The resulting underground complex turned out to be necessarily huge. It had to have the capacity to accommodate all members of Congress and supplies for several weeks ... for up to 1100 people (!) – so it required copious underground storage facilities. The bunker was maintained in fully operational readiness for over 30 years. 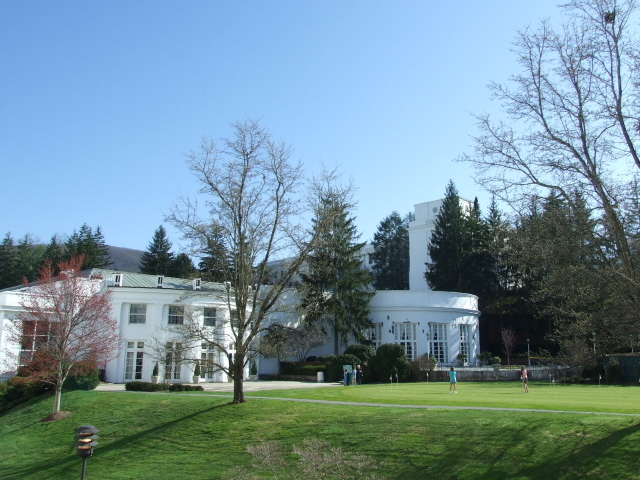 All the time complete secrecy was maintained – the existence of the facility was denied, and its entrance at the Greenbrier hotel was well camouflaged. Maintenance staff posed as TV repair personnel for the hotel under a fake company's name. In reality, the place was under secret lease by the government, via an agreement with the Chesapeake and Ohio Railway Company … necessitated by tricky legal matters which to describe in detail would go too far here. Even in Congress only the immediate leadership of the House of Representatives and of the Senate were ever informed of the existence of the bunker, whose secret official designation was "U.S. Government Relocation Facility", but code-named "Project Greek Island". It was built not so much as an A-bomb-safe bunker as such – it couldn't have withstood a direct hit – but rather as a fallout shelter. Hence the secrecy of its location was even more crucial. Firstly, new Cold War nuclear weapons technology, in particular ICBMs, reduced the warning time before an all-out attack to as little as 30 minutes. So the intended residents of this bunker could simply not have got there in time from Washington D.C., 250 miles (400 km) away! Secondly, many of the Congressmen would quite probably not have wanted to take refuge in the bunker either, as there was no space there for spouses and children. So who would have been prepared to abandon their families to nuclear hell, while holed up underground oneself? And the prospect of senior politicians crammed together in dank halls full of bunk beds, with no idea of whether they would ever re-emerge to see the light of day again, was probably not the most appealing anyway. After the end of the Cold War, the existence of the facility was revealed (namely in a "Washington Post" article in 1992) and it was subsequently phased out. In 1995 the decommissioned bunker was opened to the general public for viewing. Most of the original equipment, however, had been removed, and only a few items were left as museum exhibits. 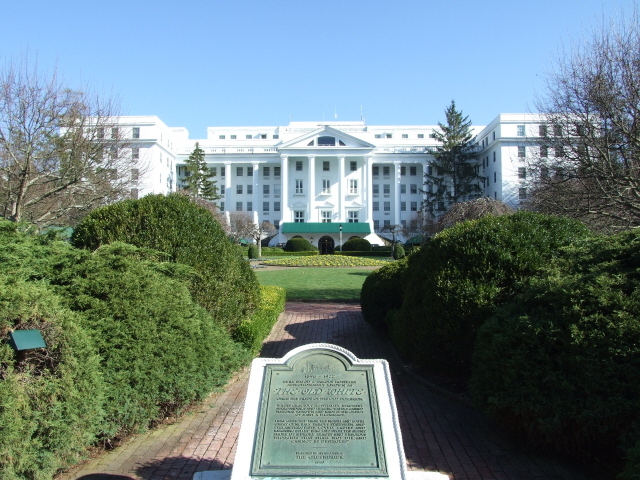 What there is to see: Whereas the huge Greenbrier hotel could hardly be more visible, with its enormously grand, southern-style, white facade, the bunker lies underneath it (or rather: under its West Virginia Wing), so can only be seen from within it. To get in, you need to sign up for a guided tour, for which prior reservations are required (see details below). Once you've parted with your dollars and (temporarily) your mobile phones and cameras (they have to be deposited, safely, with the bunker office), the guide for the group will walk you to the formerly hidden entrance. En route you will pass the chandelier room in which Eisenhower is said to have made the decision to have the bunker built here. 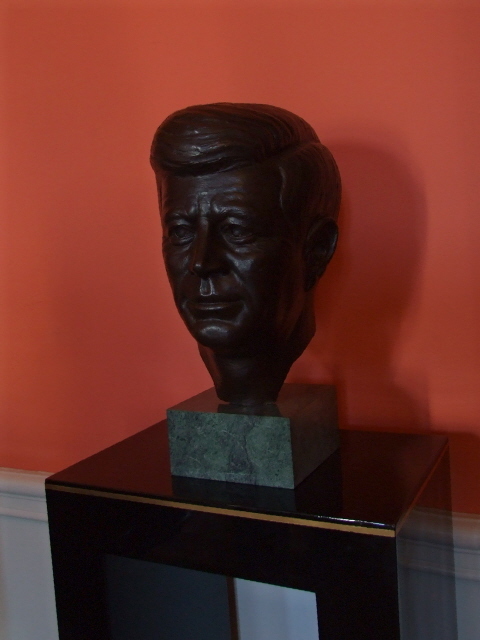 He was one of many a US president who has stayed here during the resort's long history – and apparently he was particularly fond of the place. Then you'll get to the steel door that during the days of the bunker's secret operational existence would have been cunningly hidden behind some garish wallpaper –deliberately garish in a way that would distract attention from any suspicious lines or other clues. Today there's different wallpaper, still garish, but the door is now open and fully visible. Through the door you first get to the "Exhibition Hall". In fact, this part of the bunker was even openly accessible during the years of its operation, namely as a trade exhibition space or for conferences. Only no one back then would have known that they were actually inside a bunker. Today, much the same still applies. So if you were expecting dank and gloomy concrete walls once you entered the bunker then you'll be disappointed at this stage. Instead it's just a bland, blank brightly neon-lit open space with white walls only punctuated by rows of supporting columns (the only vague clue that this is not just any ordinary exhibition hall). It does get better though. The West Tunnel entrance leads to the vehicle access to the outside world, which was used to supply and re-supply the bunker, always under the cover of night, during the years of its being kept in a state of readiness. A 25 ton blast door would have sealed the entrance off. The outside of this entrance would have been camouflaged in the past with a sign saying "danger – high voltage" to scare off any potential/accidental trespassers. Along the corridor inside the bunker tunnel, supplies of food etc. would have been stored. Today there are boxes with some sort of data storage – since a good proportion of the bunker space is currently leased out to a private data storage company. The power plant – as the bunker obviously had to be self-sufficient in terms of energy supplies too. Two large diesel engines could have seen to that for up to 40 days. Underneath the power plant's engine room is the only part of the bunker that goes down to a third underground level (the rest is on two levels only). This contains the storage tanks for water and fuel as well as an incinerator for waste – including, in the worst case scenario, dead bodies … so it's made to resemble a crematorium too. The cafeteria/kitchen – this would have been able to feed all the ca. 1100 relocated Congressmen in three sittings, so it's a big space … but today without the seating for ca. 400 people. In fact, the kitchen is now used for the cooking courses run by the hotel. So the decoration and atmosphere lack the sinister aspects it could once have exuded. On the contrary: on the columns there are collected food-and-wine related funny quotes. A bit more sinister is the sight of the decontamination entrance area. This is where the arriving Congressmen would have had to undress and would have been supplied with uniform bunker "tracksuits" (while their original clothes would have been incinerated) – after they'd had a communal shower. Just try to picture this! Dozens of Senators having to have showers together naked! By the way, special provisions would have been made for the then (in 1961) two Congresswomen, so that they wouldn't have to share the communal showers with the men … at least something. You also get to see (a part of) the former clinic – then equipped with a state-of-the-art operating room, a dental unit and 12 beds, and a fully stocked pharmacy dispensary. A highlight is the main congressional meeting room – still with its original rows of seats. In a smaller room with wallpaper photos of the Capitol in Washington (supposed to function as a reassuring backdrop), a video about the bunker's history is screened. Finally there's an Exhibit Room of artefacts, including just a couple of those bunk beds. In the past there would have been several large dormitories full of hundreds of such steel beds. After the bunker was decommissioned, these were removed (together with almost everything else) and the space is now occupied by a data storage company. Other exhibits in the museum room include electronic communications equipment – then state of the art, presumably, but today really just museum pieces. At the end of the tour I went on in April 2010, all participants were given a complimentary package of postcards – some with historic photos, some with images of the bunker as it is today. This partly made up for the fact that no photography is allowed within the bunker. Whether these gifts are always provided, I cannot say, but I would presume so. In sum: you only get to see a fraction of the original 153 rooms of the old bunker, and much of what you do see today doesn't look like it used to when it was operational, but there's still enough to make this a worthwhile dark tourism exercise. There may be grimmer bunker experiences to be had – but here it's the sheer size and general craziness of the whole bunker concept, involving 1100 Congressmen being forced to endure youth-hostel-like living conditions, coupled with the staggering contrast with the plush luxury of the Greenbrier hotel just above the bunker, which makes for something extra special. Location: roughly 250 miles (400 km) south-west of Washington D.C., and ca. 115 miles (185 km) south-east of Charleston, West Virginia; very close to the border with Virginia, at White Sulphur Springs, just off Interstate 64. Address: 300 W. Main Street, White Sulphur Springs, West Virginia 24986, USA. The meeting point for the bunker tours is inside the Greenbrier hotel at the Trellis Lobby near the Lobby Bar. Simply ask for directions at the hotel front desk or inquire with the concierge. Access and costs: restricted, by pre-arranged guided tour only, and these do not come particularly cheap. To get to the Greenbrier you can – unusually for travel within the USA – even come by train: the White Sulphur Springs resort has its own station (for connections check amtrak.com; for shuttle services to/from the hotel phone 800-453-4858 or 304-536-1110). The location is also easily reached by car as it's just off the east-west Interstate 64: the entrance to the Greenbrier hotel and resort complex is a mile and a half off Interstate 64 exit 181, to the right off Route 60, when coming from the east. When coming from the west, take I64 exit 175 and proceed eastbound on Route 60 until you come to the resort entrance on your left. Times: tours normally take place several times a day during the main season – in low season, there may be fewer, maybe even only one tour a day (most likely at 1 p.m.). To find out more or to make group or private reservations you can contact the Bunker Office direct at 304-536-7810. Charge: 30 USD for adults, 15 USD for 10-18-year-olds (that's at least the scheme during the main season, from 1 April – although it is currently no longer clear whether there will again be a low season, when prices are halved, as used to be the case – best check ahead if you're going in low season before April). No admission for children under 10, nor are any cameras or mobile phones allowed on bunker tours. This is strictly enforced: you have to hand over any cameras or phones to the bunker tour staff before going on the tour. This is not so much because of the no longer secret bunker itself, but a requirement imposed by the company that leases large parts of the bunker these days, namely for data storage. Time required: bunker tours last approximately 90 minutes. Make sure to be at the bunker tour meeting point, at the Trellis Lobby behind the Lobby Bar, at least 15 minutes prior to the start of the tour. This is for registration of participants – and of their deposited phones and cameras. Allow enough time for a) getting there and for parking, especially if you're not a resident at the hotel, and b) for making it to the meeting point at the Trellis Lobby – the Greenbrier really is an enormously large building/complex. Combinations with other dark destinations: nothing else in the immediate vicinity, but to the north-west of the Greenbrier is the former Trans-Allegheny Lunatic Asylum at Weston, WV, and further north from that the West Virginia Penitentiary at Moundsville, WV, by the Ohio River just south of Wheeling, WV. The Greenbrier can also be reached within a few hours from Washington D.C. – for destinations yet further afield see under USA in general. Combinations with non-dark destinations: most obviously, the Greenbrier itself is an outstanding destination in its own right. The proportions of the complex and its plush pompousness are really quite breathtaking. 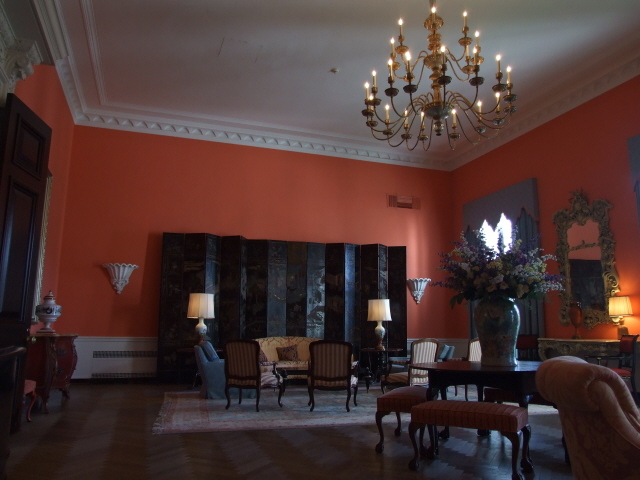 The style of the interior design (by Dorothy Draper) may not be to everybody's taste, and indeed much of it would probably look rather dodgily over the top elsewhere. However, it's the dimensions of the place that make this style kind of work here, I found. The public areas are so large you can almost get lost in the endless corridors and successions of different lobbies. In fact, when it's not busy, the long corridors and empty ballrooms conjure up vaguely surreal impressions almost reminiscent of Stanley Kubrick's "The Shining". Ownership of the hotel, by the way, has gone through several hands over recent years, and apparently it has not always been run to the standards expected of such a top-notch grand place. That's if older reviews are a realistic indication. When I stayed there in April 2010 with my wife, however, I could not fault the place or the staff in any way. The attention to detail was formidable and the staff very competent. At times I found the courteous friendliness extended by the hotel almost excessive – but that's not a complaint. Given the standards that the hotel is clearly striving for, the price for accommodation was surprisingly affordable for its class, at least when booked in advance online. On the other hand, all extras, not least food and drinks do cost dearly, so it's not a place for misers! But I'd say it's well worth experiencing, and you can always cut costs by eating in one of the newer, more casual eateries on the complex rather than in the formal and grand main dining hall. The hotel offers all manner of activities (again, at a hefty price, except for the swimming pool), most prominently golf, for which the Greenbrier is famous. The rest of the extensive grounds of the complex can mostly be explored for free. The original sulphur spring is these days only of historic interest and the water does not look particularly inviting (on the contrary) – the actual spa offerings are to be found elsewhere today and there's a wide range to choose from. At the time I visited in April 2010, the Greenbrier's new owners were also adding a casino ... somewhat controversially, but apparently owing to economic pressures. The construction work at/under the main entrance was apparently to be completed soon. By the time you read this it will definitely be open. So if you feel like blowing even more money, this casino will be best place to do so (though personally I'd rather invest it in a posh dinner and some good wine). Further afield it's the call of nature that forms the main tourist attraction. In particular, the Shenandoah National Park is within easy reach: it's only an hour's drive or so to the southern entrance and its access to the famous Skyline Drive that leads all the way along the ridge of the mountains to the northern end of the park at Front Royal. (If you set off early enough you can even slot in a drive through the park en route to the Greenbrier when coming from Washington D.C.) To the west of the Park lies the pleasant Shenandoah valley with its wineries and caverns (most famously at Luray, but also the Grand Caverns at the aptly named small town of Grottoes). Surrounding White Sulphur Springs are the scenically forested Allegheny mountains area and to the west the superbly picturesque New River Gorge and "National River" Park. At Fayetteville, en route to Weston, the world's third longest single-span steel bridge crosses the gorge (see under Trans-Allegheny Lunatic Asylum).